A soldier and physician writes of overcoming wounds visible and invisible upon returning from battle. “Use your Army skills….View the change as any change in the battlefield.” It’s perhaps not the advice most stroke victims might expect to receive, but it’s military issue, and it did the job. 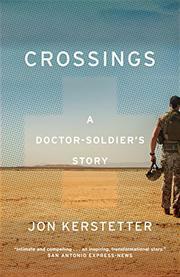 As Kerstetter writes, he came into the military late, joining the Iowa National Guard as a doctor during Desert Storm at the significantly advanced age of 42. That was a subject of much worry to his wife, he writes, since he would “always be answering to officers ten to fifteen years younger.” His reply: “Most of the officers in our class were young, brash and full of vigor. I was older but still full of vigor.” As a flight surgeon during the subsequent Iraq War, he saw the horrors of war up close; in one of the most gruesome episodes, he was called on to fit exploded body parts together for identification and was “overtaken by a certain dread and hopelessness that all of human life was reduced to the emptiness of gritty sounds and the mechanical vibrations of a body bag zipper.” The author’s emergence as a military doctor makes for interesting reading, as he traveled from poverty on an Oneida reservation in Wisconsin to a critically important role in frontline lifesaving. But what is of greatest value in this narrative is Kerstetter’s ongoing, twofold recovery from a stroke on one hand and PTSD on the other. In the latter instance, as he writes, he was not especially helped because, convinced as so many soldiers are that emotional stress is a weakness, he ran up against a doctor who ran things by clipboard: “when she spoke about war and trauma, it seemed to me she did so from the vantage point of a textbook or VA seminar on treating soldiers.” The author’s medical perspective on his own condition and critical therapeutic moments adds depth to an already solid story. An inspiring memoir that will be highly useful to readers struggling with PTSD and other wartime injuries.